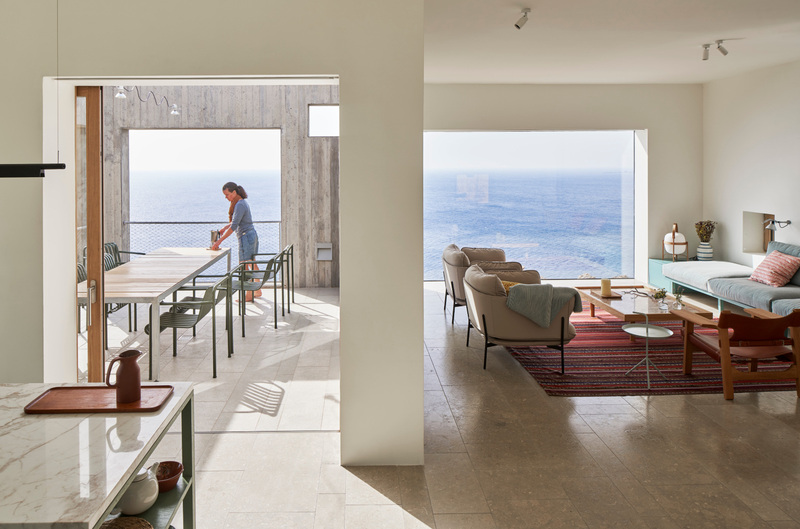 When Stockholm-based firm, OOAK Architects were tasked with building a beautiful home for two windsurfing aficionados on the Greek island of Karpathos, they created a design completely driven by the incredible surrounding nature. 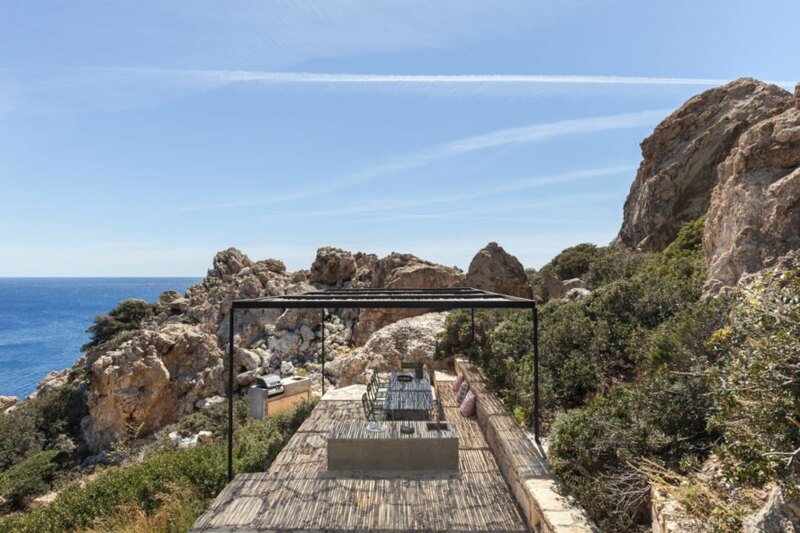 The Patio House is a beautiful concrete home with large open cutouts that sits gently on the landscape, cantilevering over the rocky cliff to provide breathtaking views of the Aegean Sea. 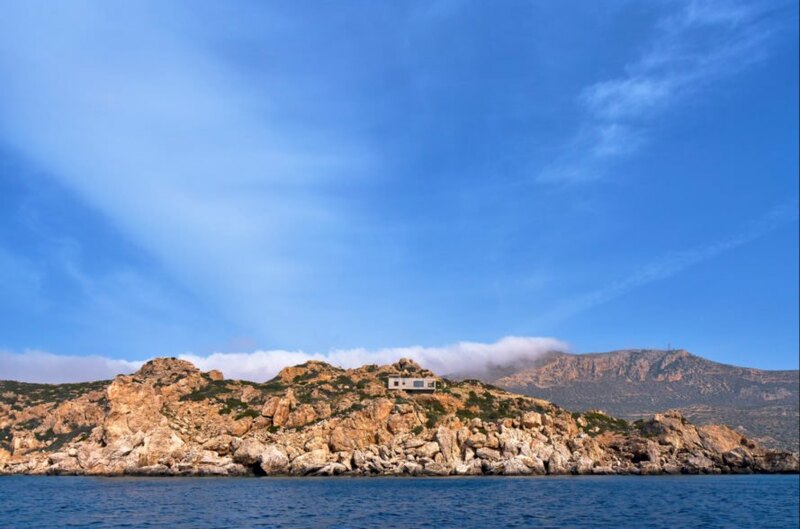 According to the architects, the design and orientation of the home was driven by the rugged landscape, which is comprised of two stepped plateaus. 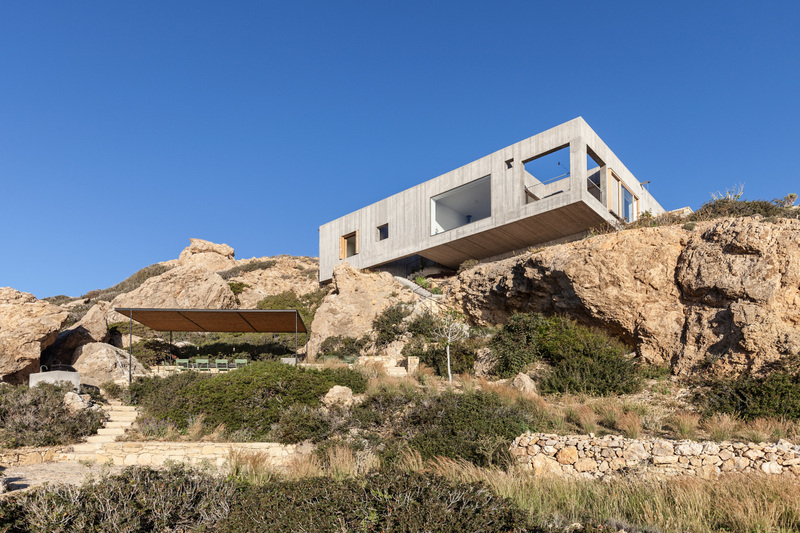 Due to the nature of the terrain, the architects decided to cantilever the home from the higher ledge, a decision that would optimize the amazing sea views. The natural terrain not only influenced the home’s overall design, but also its materials. 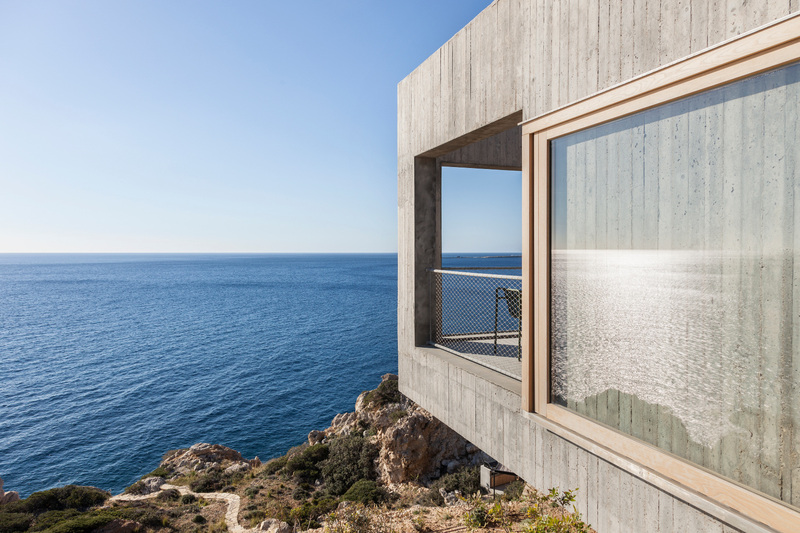 To install the home into the rocky cliffside, the architects built the home with reinforced concrete, clad in a board-marked finish that gives the home a strong Mediterranean aesthetic. Additionally, the home’s roof was covered with gravel to blend in with the surroundings. The home’s volume is a fairly simple horizontal silhouette that stands out due to its various distinctive cutouts. 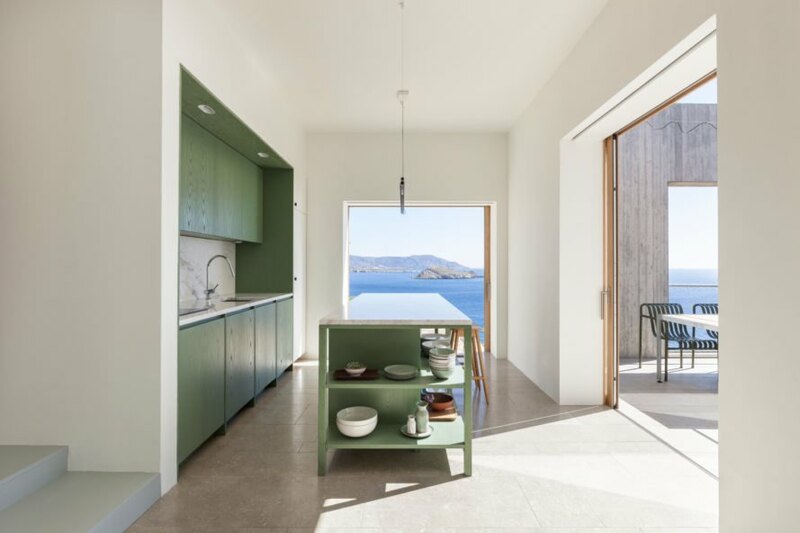 These large apertures, some windows and some left completely open, were strategic to provide breathtaking views of the Aegean Sea from virtually anywhere in the home. The interior design, which includes Scandinavian-inspired furnishings and all white walls, is bright and airy, giving the design a fresh, modern aesthetic. 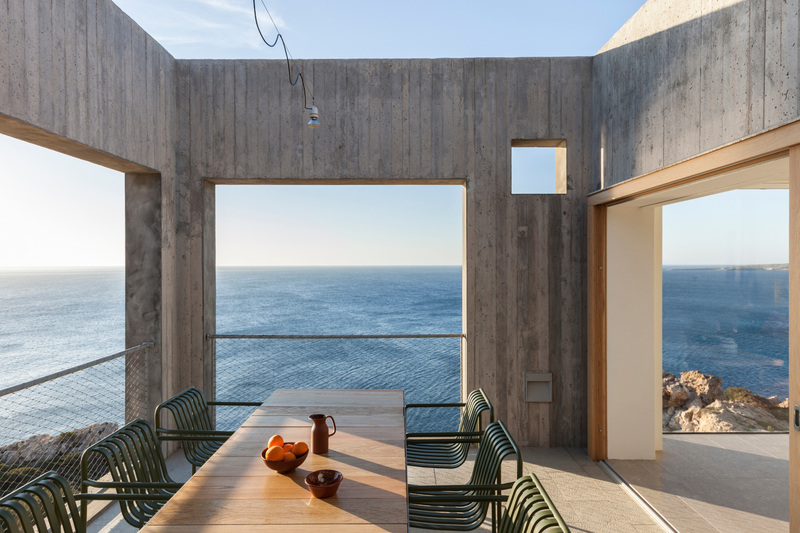 Located high above the sea, the home is often exposed to strong winds, which prompted the architects to add a sheltered open-air patio at the heart of the living area. This space is a usable outdoor space, with a small dining area and plenty of greenery, that the family can use to enjoy fresh air despite the severe winds. For entertaining, the homeowners can also enjoy a large terrace that was placed on the lower plateau and accessed by a large staircase. 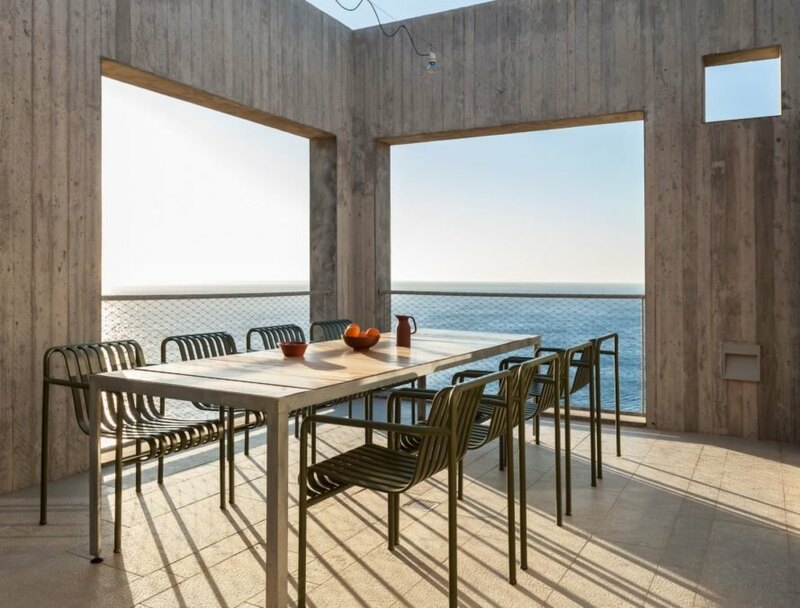 OOAK Architects designed the Patio House to provide the best views of the sea. 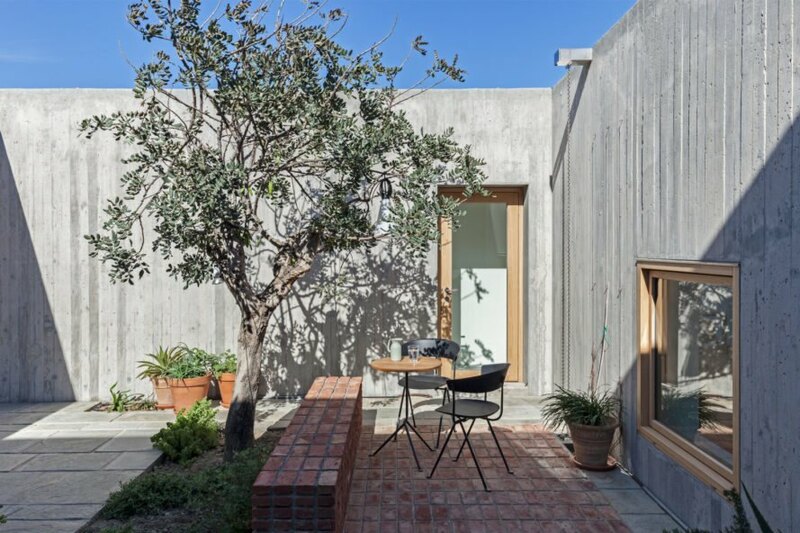 The home is made out of reinforced concrete with a board-marked finish. 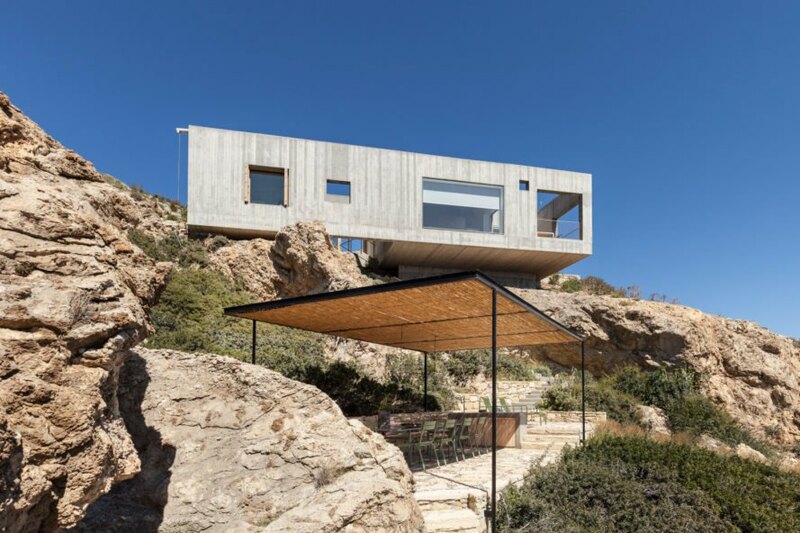 The home cantilevers over the rocky cliffside. Large square cutouts were added into the design to frame the amazing views. The large cutouts and windows provide a seamless connection between the interior and the surrounding environment. The home's interior has all-white walls and simple furnishings to put the focus on the views. The outside dining area is at the heart of the home. The outdoor patio is the perfect spot for entertaining. The home's board-marked finish blends the building into the natural landscape. A separate covered patio is located down a flight of stairs. The home's roof was covered in gravel to blend into the rocky cliffside. The gravel roof blends into the landscape. The home design provides stunning views from virtually anywhere in the home. Large glass facades flood the interior with natural light. The home sits perched on the landscape. The home's interior design is minimalist in nature. The bathroom and kitchen space are open and airy. The home ha an interior courtyard that also brings the exterior into the home. The home sits in solitude high up on the cliffs. The home is a simple design created to blend into the landscape. The home is a beautiful design in an incredible setting.